Federal Minister for Climate Change, Mushahid Ullah Khan, has been elected a chair of the Global Snow Leopard & Ecosystem Protection (GSLEP) programme, after representatives of 12 snow leopard range countries, where snow leopard is found, voted in favour of the minister. Kirghizstan was elected as co-chairman of the GSLEP. According to a press statement issued here on Sunday, the voting for electing chair of the GSLEP’s steering committee was held during the concluding session of the two-day first international steering committee meeting of the GSLEP programme. The meeting took place in Bishkek, Kyrgyzstan’s capital on March 19 and 20, and was attended by ministers, bureaucrats, and conservation organisations from 12 range countries including Nepal, Bhutan, India, China, Pakistan, Afghanistan, Tajikistan, Russian federation, Uzbekistan, Kazakhstan, Mongolia. 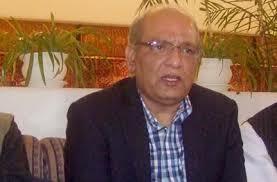 Federal Minister for Climate Change, Mushahid Ullah Khan represented Pakistan at the meeting. After assuming chair of the steering committee of the GSLEP programme, Mushahid Ullah Khan thanked the delegates of participating countries for their confidence and entrusting him with the chair of the steering committee. He told the delegates of the 12 snow leopard range countries that he would commit his time to come up to the expectations on the trust bestowed upon him. He also reiterated the will of the present Pakistani government and Prime Minister Nawaz Sharif and said that Pakistan is seriously committed to the global efforts for protection and conservation of endangered snow leopard. There are only approx. 3,000 snow leopards left in the world and found only in the 12 range countries. Earlier, while addressing steering committee meeting of the GSLEP here, the minister Mushahid Ullah said that like other countries population of snow leopards has also declined rapidly in Pakistan because of varied reasons including illegal hunting and climate change.